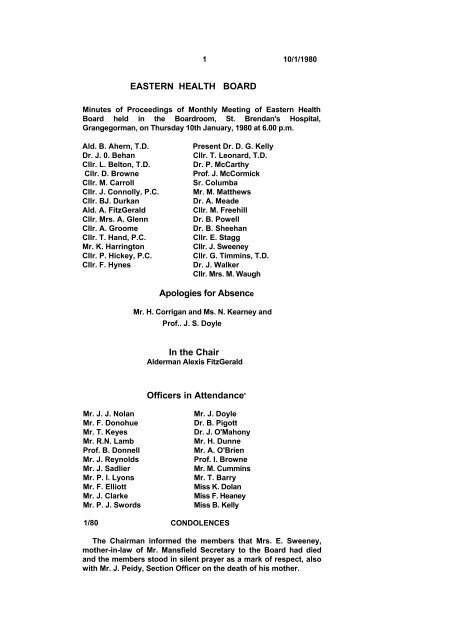 1 10/1/1980 EASTERN HEALTH BOARD Minutes of Proceedings of Monthly Meeting of Eastern Health Board held in the Boardroom, St. Brendan's Hospital, Grangegorman, on Thursday 10th January, 1980 at 6.00 p.m. Ald. B. Ahern, T.D. Dr. J. 0. Behan Cllr. L. Belton, T.D. Cllr. D. Browne Cllr. M. Carroll Cllr.  J. Connolly, P.C. Cllr. BJ. Durkan Ald. A. FitzGerald Cllr. Mrs. A. Glenn Cllr. A. Groome Cllr. T. Hand, P.C. Mr. K. Harrington Cllr. P. Hickey, P.C. Cllr. F. Hynes Present Dr. D. G. Kelly Cllr. T. Leonard, T.D. Dr. P. McCarthy Prof. J. McCormick Sr. Columba Mr. M. Matthews Dr. A. Meade Cllr. M. Freehill Dr. B. Powell Dr. B. Sheehan Cllr. E. Stagg Cllr. J. Sweeney Cllr. G. Timmins, T.D. Dr. J. Walker Cllr. Mrs. M. Waugh Apologies for Absence Mr. H. Corrigan and Ms. N. Kearney and Prof.. J. S. Doyle In the Chair Alderman Alexis FitzGerald Officers in Attendance' Mr. J. J. Nolan Mr. F. Donohue Mr. T. Keyes Mr. R.N. Lamb Prof. B. Donnell Mr. J. Reynolds Mr. J. Sadlier Mr. P. I. Lyons Mr. F. Elliott Mr. J. Clarke Mr. P. J. Swords 1/80 Mr. J. Doyle Dr. B. Pigott Dr. J. O'Mahony Mr. H. Dunne Mr. A. O'Brien Prof. I. Browne Mr. M. Cummins Mr. T. Barry Miss K. Dolan Miss F. Heaney Miss B. Kelly CONDOLENCES The Chairman informed the members that Mrs. E. Sweeney, mother-in-law of Mr. Mansfield Secretary to the Board had died and the members stood in silent prayer as a mark of respect, also with Mr. J. Peidy, Section Officer on the death of his mother. 100 Agreeing with the speakers Dr.
217 4/9/1980 On a proposal by Cllr.